It is with deep sorrow that we must announce the death of our dear chief, Timothy Fawcett Wood of Largo. Following a long illness, he passed peacefully away at home in the evening of Thursday the 28th of September 2017, surrounded by his family. Our condolences go to his lovely wife, Emma, his titular heir, Joseph, and all his family whose grief we share. A true gentleman in every meaning of the term, his wise chiefship enlightened all our lives. At the request of the Standing Council of Scottish Chiefs, Clans Broun, Maclean and Wood opened the Royal Military Tattoo on the 9th of August by parading out on to the castle esplanade to receive a ceremonial welcome from the castle's officers. 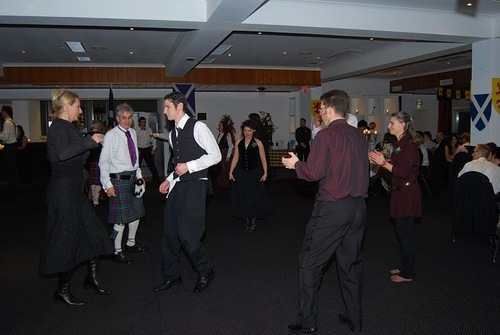 Here are some of the pictures taken that evening, beginning with the first arrivers as the clan started to assemble in the old town beforehand. L to R: Josh of St. Andrews, Fife bearing the Clan Flag; David of Dartmouth, Devon; Graham of Forres, Moray; Nick of Dartmouth, Devon bearing the Chief's heraldic flag called a pinsel; Ruth and Randy of Oviedo, Florida with their daughter Allison and son Michael. Members of the Society can contact any of the above by email on matters connected with the running of the Society. Your helpful comments and suggestions are always welcome. In the true maritime tradition of our chiefly family the Woods of Largo, CWS member Don Wood of the ancient English Channel port of Lymington was awarded the prestigious Panerai Trophy after winning the Panerai Classic Yachts Challenge at Cannes in September 2016 in his superb one-tonner 'Ganbare'. Built from red cedar wood in 1973, she completed three rounds of the circuit, doing battle with other world class craft such as the 'Naif', 'Il Moro di Venezia' and 'Sagittarius'. Very well done, Don and your worthy crew! Our warmest congratulations to Lisa and Danny Wood of Nova Scotia upon their marriage. We wish them a long and happy life together. The limited number of images and short video snippets that Bryan has been able to upload by computer can be viewed at http://www.youtube.com/results?search_query=clanwoodsociety&aq=0 . First and foremost it was an historic family occasion, and a quite magical atmosphere grew up during the after-lunch 'pilgimage' to Sir Andew Wood's Tower and the kirk on that unforgettable day. Bill and Bryan would be the first to agree that the quality of their pictures is not quite as high as professional standard (why would it be? ), but if you can be tolerant of occasional background sounds, you will be able to glean a good impression of the happenings at the Reception. There are some additional images taken on the previous day, during the Canadians' private visit to their ancestral homeland. You will see the new Clan Flag being displayed for the first time, and hear debut performances of two superb new marches played by Diarmid Lindsay, official piper to Robert Lindsay, Earl of Crawford and Balcarres, both of whom live close by. One of the tunes composed specially for the occasion, "The Yellow Caravel", was written by Diarmid himself. The second, by CWS member George Wood of Kirkcaldy, is called "Sir Andrew Wood's 'Flower' (Battling Home to Largo)". Both tunes brilliantly evoke the maritime spirit and times of the Admiral, the legendary founder of the Wood of Largo chiefly family. Diarmid hopes soon to publish a compendium CD of bagpipe music which will include these two remarkable pieces. Copies of the complete 42-minute DVD containing highlights of the Reception can be sent to members as keepsakes, on request to the Secretary on scotswood1@btinternet.com . Many of the people present at the Reception were seated outside the fixed video camera's range of vision. Very sadly, we must announce the death of our loyal friend and colleague, Bill Wood. 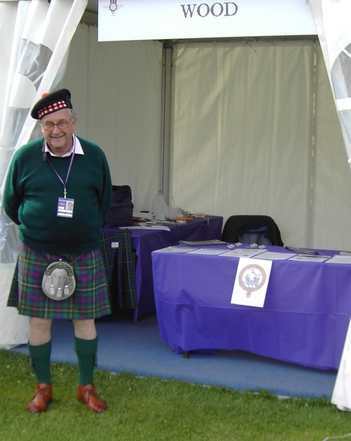 A founder member of the Clan Wood Society and a keen participant in the Council's promotional activities, Bill was a key member of the team which represented the Clan at the enormous Gathering2009 in Edinburgh, and he played a significant part in preparing the arrangements for the Inauguration Reception held for our Chief on the 21st May 2011 in Upper Largo - an occasion which he himself missed because his son in America got married that day. His house in Earlsferry is on the 16th century estate of Grange once held by the Admiral's family, just a short drive down the northern shore of the Forth estuary from the old Wood barony of Largo. Bill was an enthusiastic sportsman. A keen follower of rugby football, he avidly followed the Scotland 15 to watch in person the team's major matches during the annual Six Nations Cup tournament. He played golf as often as he could, and we understand that he collapsed while playing this his favourite game. We are greatly indebted to Bill for his support over the years, especially during the formation of the Clan Wood Society. The Chief and every member of the Council send heartfelt condolences to Bill's widow, Jennifer, his sister, Marina and to all his family. We too will miss him. 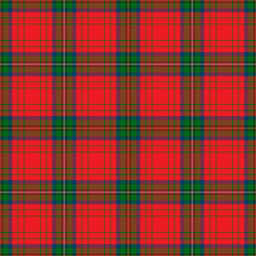 For people who like to wear bright colours occasionally, the Clan Wood Society has recorded in the Scottish Register of Tartans a new tartan called the Wood, Dress. 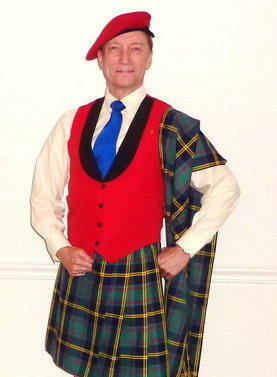 Dress tartans were traditionally brighter versions of a clan's older official tartan and were usually dominated by red. The addition of white became fashionable only in the late 19th century. We have reverted to the original custom by expanding the distinctive 5 red stripes of the clan tartan to dominate, while the other colours and design features remain in proportion. 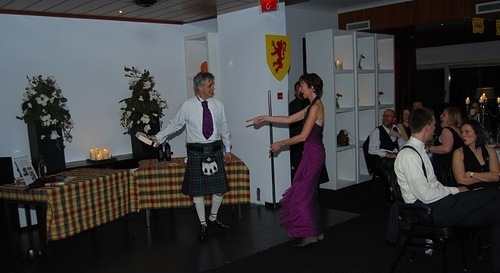 This Dress tartan has not replaced our Clan tartan. It is 'an optional extra', you might say. It is not currently available from the clan shop because it is a 'special weave' that is very much more expensive to produce in short lengths. On the 3rd day of December 2010, Timothy Michael Herbert Fawcett Wood matriculated the undifferenced Arms and Supporters of Admiral Sir Andrew Wood of Largo at the Court of the Lord Lyon King of Arms. He is the hereditary Representative of the Ancient Family of Wood of Largo and Chief of the Name. A baron of Scotland, he has been appointed to the supreme Standing Council of Scottish Chiefs. The chiefship of our formally styled Honourable Clan seems secure for generations to come. 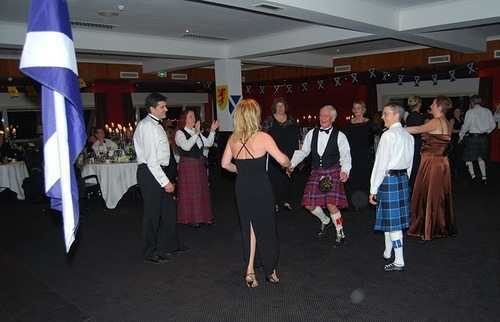 If you visit www.scots-in-assen.nl you can see their members spiritedly celebrating St. Andrew's Day last November. Lots of photos and a video. Here is our Thom Wood proudly doing his thing for the Woods at the 2009 Annual Scottish Games in Greenville, South Carolina, USA. He bedecked his bicycle with blooms cleverly colour-co-ordinated with our tartan, then he dressed himself to match. No wonder he got a lot of applause as he rolled down Main Street. Good on you, Thom! This is just part of the Clan Village that occupied a corner of the huge Gathering site in Holyrood Park, the grounds of Holyroodhouse Palace, home of the kings and queens of Scotland, during the weekend of 25th / 26th July. The Gathering was planned to be the biggest ever held anywhere in the world. 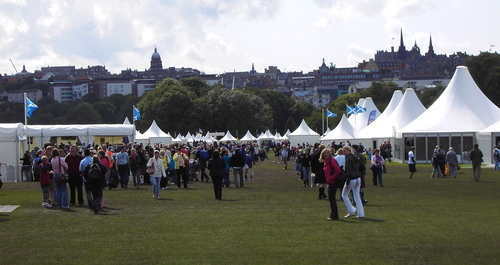 Yet it exceeded everyone's expectations in terms of numbers of clans participating, competitors in the games, pipe bands, high quality arts and crafts displays and so much more. The press afterwards reported that over 60,000 people had flocked to the grounds, that there were 6,000 clan members in the Saturday evening Parade up the Royal Mile to the Castle to watch the Pageant there, and that the Edinburgh streets were lined with enthusiastic crowds of some 20,000 onlookers spontaneously cheering us on. We all felt privileged to be taking part in such an historic event. 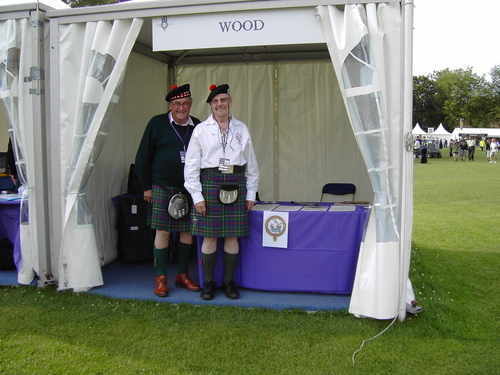 Here are Council members Bill (L) and Secretary Nick (R) Wood at the Society's clan tent, two of the team who welcomed hundreds of visitors who wanted to know more about the history of the Wood clan and its modern revival. The Society's stocks of scarves and neckties in the tartan sold out far too quickly and, immediately afterwards, more had to be ordered for the website shop. Clan Crest Badges were, of course, popular essential buys. 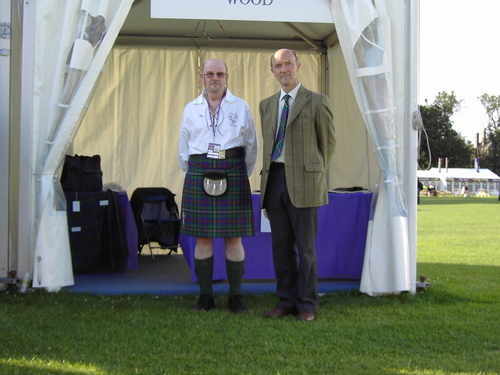 Representer of the ancient House of Wood of Largo, Timothy Fawcett Wood, seen here with Nick, was one of the volunteers who manned the clan tent during the Gathering. 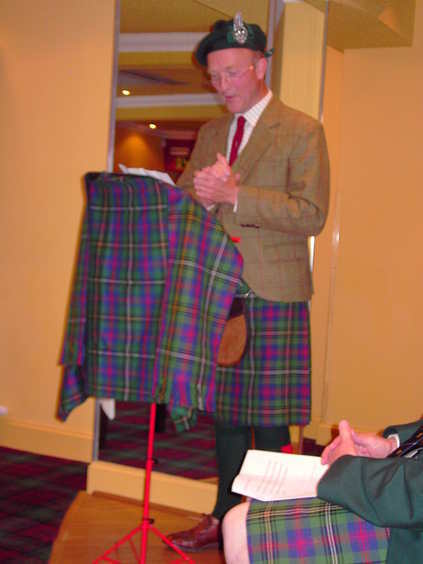 Nick was asked by the Standing Council of Scottish Chiefs to attend the Clan Convention held on the day before the Gathering. 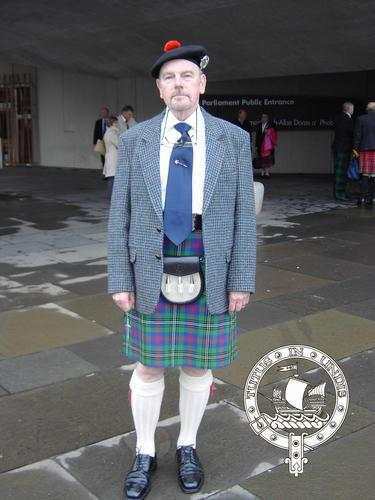 He was photographed outside the Parliament Building prior to joining the assembled clan chiefs to spend the day discussing the role of the Scottish clans in the modern world. Here are some interesting videos of the Gathering posted on YouTube. The opening one features the latter half of the big Parade mentioned above. The Woods came second to last before the Youngs!